So it’s time to take stock, decide what our writing strategy is, plus make meaningful goals and stick to them. But before we do all that, now’s a great time to give ourselves a confidence BOOSTER! 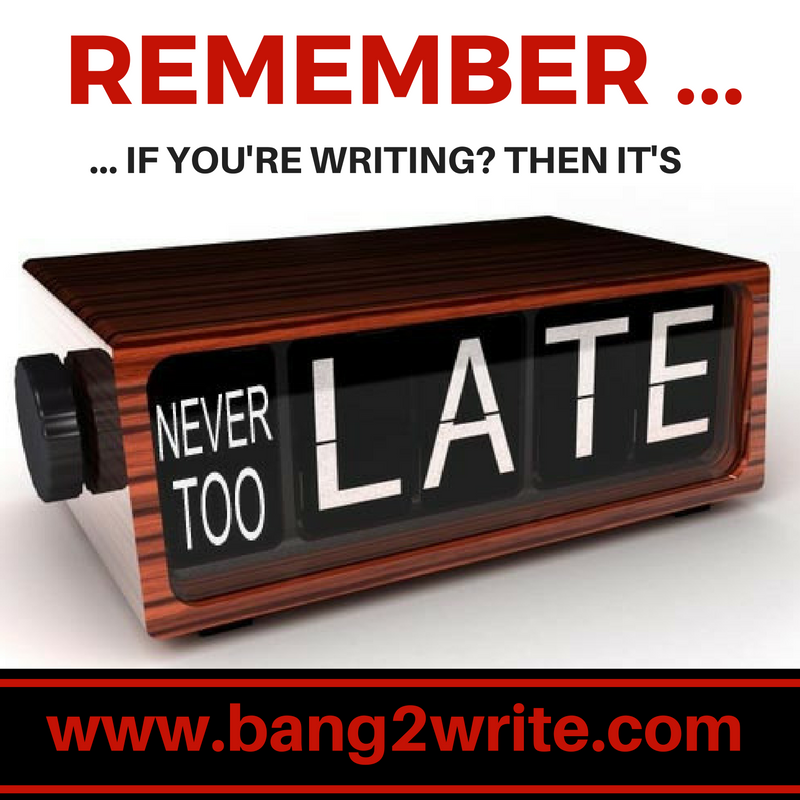 NEWSFLASH – it is never too late. Now, I don’t want to put a downer on proceedings, but the facts are, any one of us could die at literally any moment. So really, it doesn’t matter if you’re 19 or 90! We probably won’t die though, so in which case USE YOUR TIME WISELY. This means, if you want to be a writer?? EFFING WRITE. Go for it. Why wouldn’t you? The 30 top creatives on the list below didn’t let anything get in their way in their dreams of success — least of all age! As long as you’re still breathing, you got this. So go get it. And by the way, if you click on either of the pics in this post you can download the motivational poster as an A4 (PDF) to print out and put up next your desk. Enjoy! 1) Frank McCourt was 66 years old when he published Pulitzer prize-winning Angela’s Ashes. 2) Cormac McCarthy might be most famous for his novels, but he was a whopping 80 years old before he wrote the screenplay for The Counsellor. 3) Vera Wang was 41 years old when she opened her first Design studio. 4) The Marquis De Sade wrote his first book in prison, aged 42! 5) Steve Carrell was 43 when The Office aired, making him a household name. 7) Laura Ingals Wilder was in her 60s before she published the first of her Little House On The Prairie series. 8) Liz Smith didn’t have her acting breakthrough until she was 49 in Mike Leigh’s Bleak Moments. 9) Nora Ephron was 42 when she got her big break with Silk Wood. 10) Toni Morrison was 39 before she wrote her first novel. She won The Nobel Prize for Literature in 1993, when she was 62. 11) Richard Adams published classic children’s novel Watership Down when he was 52 years old. 12) Raymond Chandler published the awesome classic, The Big Sleep at 51. He wrote the screenplay for Double Indemnity at 56. 13) Steven Segal was 40 before he became an martial arts action hero thanks to Under Siege. 14) Ron Bass was 46 before he wrote the Oscar-winning Rain Man. 15) Charles S. Bukowski was 49 before he was able to devote himself to writing full-time. 16) William S. Burroughs was 45 before he released the controversial Naked Lunch. 17) Millard Kaufman might have written his first screenplay at 32 (which featured a certain Mr. Magoo), but he was 90 when his first novel was published! 18) Bram Stoker was 50 before he published the granddaddy of all vampire stories, Dracula. 19) Samuel L. Jackson was 40 before his breakthrough role in Spike Lee’s Jungle Fever. 21) Helen DeWitt published The Last Samurai when she was 41 and had already gone through many problems, including a suicide attempt. 22) David Webb Peoples was 42 when he wrote the sci fi classic Blade Runner. 23) Anthony Burgess, most famous for A Clockwork Orange, didn’t get his first novel published until he was 39. 25) George Elliot didn’t publish Middlemarch until she was 51. 26) Colonel Sanders was a whopping 62 years old when he came up with KFC! 27) Guillermo Arriaga was 42 when he wrote the amazing Amores Perros. 28) David Seidler wrote the screenplay for Malice In Wonderland when he was 48. 29) Rev. Wilbert Awdrey developed the stories for Thomas The Tank Engine and published them when he was 34. CLICK HERE or on the pic below to download as a motivational poster to print out and display next to your desk! HAPPY NEW YEAR! 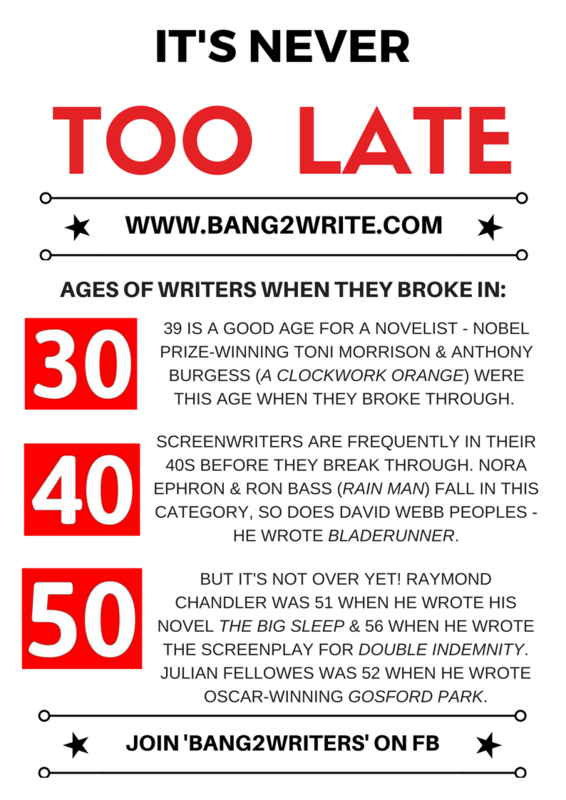 And DON’T FORGET — lots of writers on this list were even older than in their 50s when they broke through … If you’re still breathing and you’re still writing, then GO FOR IT!! What’s the worst that can happen?? My first book, Beautiful, a psychological thriller, was published in September 2015. I was 69 years old. I will be 71 in seven days time, and my fourth book, Winterscroft, will be published in February. Age has nothing to do with dreams. You spelled Ingals wrong. Please note Ing-alls 2 “L”s not one. Otherwise good article.